We could label them jazzrock, prog, psych or instrumental rock, but Demoner’s true call is to create groove, pain, anguish and ecstasy and to press “Play” on the movie inside your head. The band came into existence when it’s members met and played together at Malmö Academy of Music. Their debut “Anakronism” was recorded live in studio to capture the organic partners…hip between the musicians, and released in May 2014. It was their first gig – as opener for Gösta Berlings Saga in November 2013 – that impressed the PC organizers and secured Demoner’s way to PC15. The line-up consists of main composer Simon Frödeberg (bass), Joakim Jensen (drums), Joakim Svensson (guitar), Johan Thuresson (guitar), Johan Pihleke (keyboards) and Rasmus Nyvall (tenor saxophone). 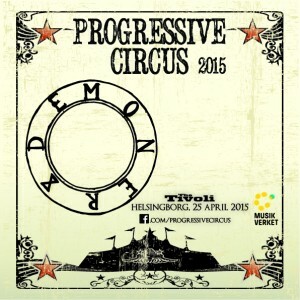 Don’t miss their concert at Progressive Circus 2015!! !